– The bacterial flora in human dental plaque is diverse and complex, consisting of more than 700 bacterial species, whereas a small subset of the species is considered to be the primary agents of periodontal diseases. – The periodontal pathogens generally belong to the obligate anaerobe group, and isolation of these species is technically very demanding and time-consuming. – On the other hand, the recent development of molecular biological techniques enables the analysis of the periodontitis-related species without bacterial isolation. – The PCR technique using the bacterial DNA extracted from the specimens can identify the bacteria with species-specific sets of primers, whereas the disadvantage of this approach is that only selected species can be analyzed. in the specimens since the primers are designed for the common region of the 16S rRNA sequences for eubacterial species. data bases but it takes more time and is relatively expensive compared to the conventional PCR method. 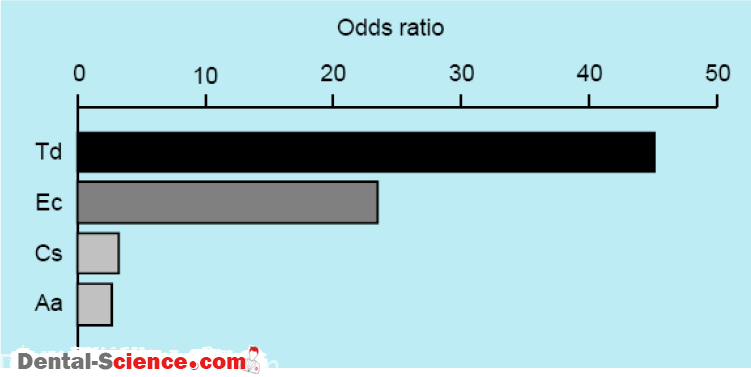 – In addition, a quantitative PCR method can be used to determine the bacterial levels in the specimens. – It is also important to decide whether saliva or dental plaque specimens are to be analyzed when using these techniques. 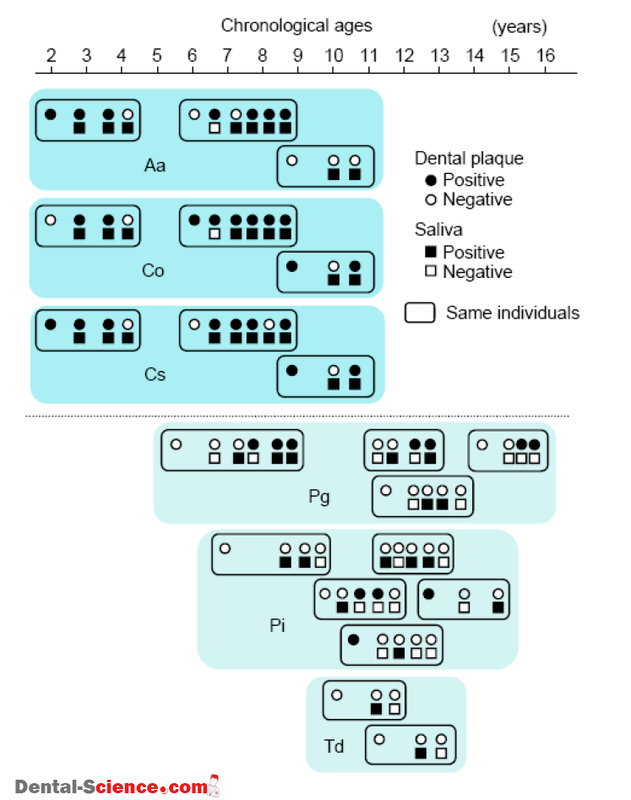 – Whole saliva specimens generally reflect the entire bacterial profiles in the oral cavity, whereas the profiles of the dental plaque specimens are limited to those of the collected area. – Thus, we must carefully consider which specimens match the purpose of studies prior to their initiation. – In addition, the timing of collection of the specimens is also important. We generally collect the specimens for the initial stage at the second visit to our clinic, prior to giving detailed tooth brushing instructions, which enable us to determine the natural bacterial profiles of each subject. – The procedures for extraction of the bacterial DNA are as follows. – The subgingival dental plaque specimens are collected in sterile saline, which are centrifuged at 15000 rpm for 5 min to pellet the bacterial cells. Bacterial genomic DNA is extracted from each pellet using a DNA isolation kit (Puregene, Gentra Systems, Minneapolis, MN, USA). – As for the saliva samples, expectorated whole saliva collected from each patient is mixed with Chelex 100 (Bio-Rad Laboratories, Hercules, CA, USA), which is then incubated at 56°C for 30 min, followed by boiling at 100°C for 10 min. (formerly Actinobacillus) actinomycetemcomitans (Aa), Capnocytophaga ochracea (Co), Capnocytophaga sputigena (Cs) and Treponema denticola (Td), based on previous reports showing that their distributions in periodontitis patients were significantly different from those in periodontally healthy subjects. – Previous table lists the primer sets specific for each species used in our studies, all of which were checked for specificity as well as sensitivity and was reported to range from 10-100 cells in the original studies. – There were two species identified in the saliva specimen of subject A, whereas 6 species were detected in the specimen taken from subject B. – There have been few reports describing the results of the distribution of periodontal bacterial species in children and adolescents when we initiated this study. – It was generally known that children with periodontitis are rarely encountered, which might be one of the reasons for the few studies analyzing their distribution. – Therefore, we decided to analyze the distribution of the 10 selected bacterial species in the dental plaque and saliva specimens in children and adolescents who came to our clinic. – Dental plaque specimens were collected from the buccal-mesial sulcus of the first molar or second primary molar in the right upper quadrant of 119 systemically healthy children (56 boys and 63 girls) aged 2 to 13 years old, who showed negligible periodontal inflammation, and their whole expectorated saliva specimens were also collected. – The total numbers of dental plaque and saliva specimens collected from these subjects were 300 and 208, respectively. – PCR detection using 10 species-specific primer sets showed that approximately 15% of the subjects were negative for any of those 10 species. 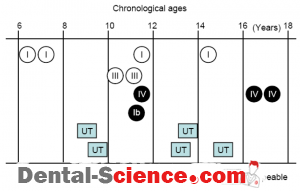 – The total numbers of the detected species increased gradually with age until 5 years old and then reached a plateau after the mixed dentition period. T. denticola were rarely identified. 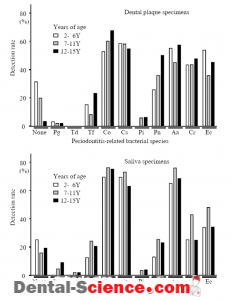 – These results suggest that the colonization of many periodontal bacterial species occurs quite early in childhood without clinical signs of periodontal disease. In contrast, there are several species exhibiting poor colonization, such as P. gingivalis and T. denticola. – Next, in order to determine which species are inhabitants or are transient, the subjects whose specimens were collected more than twice for more than 2 years were analyzed. suggesting that these are the common members of the oral flora of periodontally healthy children. 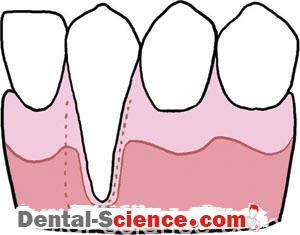 – It is of interest to determine the distribution of the periodontal species in subjects over time. continued to attend annual recall examinations until 2006–2007. periodical examinations were performed but also professional tooth cleaning as well as brushing instructions were provided. – On the other hand, there were several subjects with periodontal pocket depths of 4-5 mm without attachment loss. species. 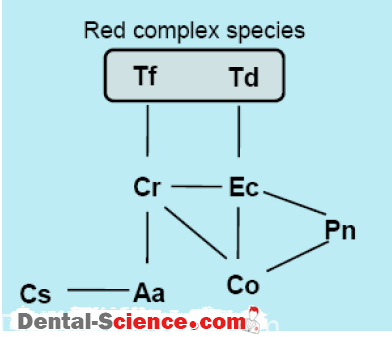 P. gingivalis, T. denticola, and T. forsythiacomprise the “red complex” (RC) group of species, a prototypical polybacterial pathogenic consortium active in periodontitis. 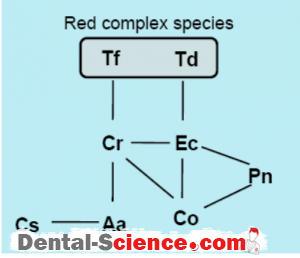 – RC species are also known to be correlated with gingival inflammation based on studies of Japanese teenagers. 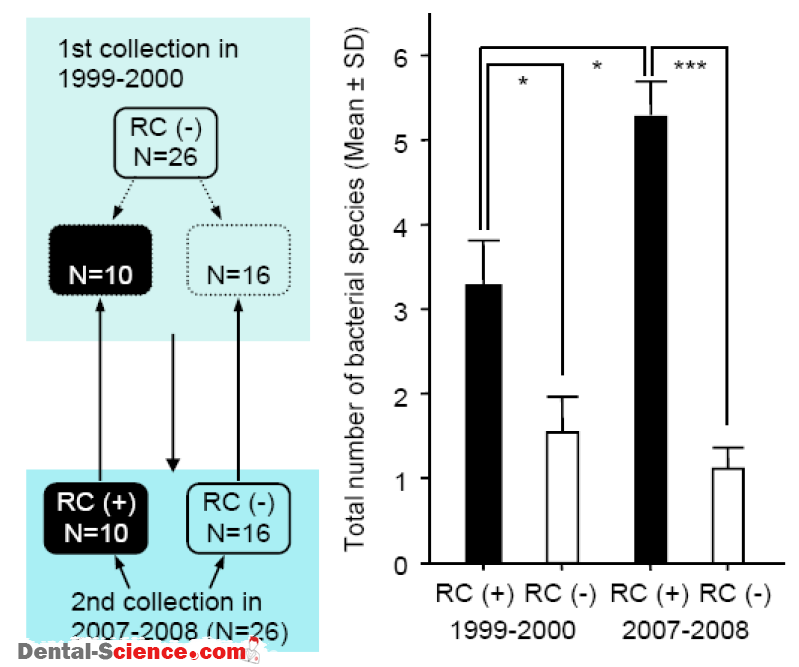 – We further analyzed the bacterial profiles in the first and second collections focusing on the presence of RC species. 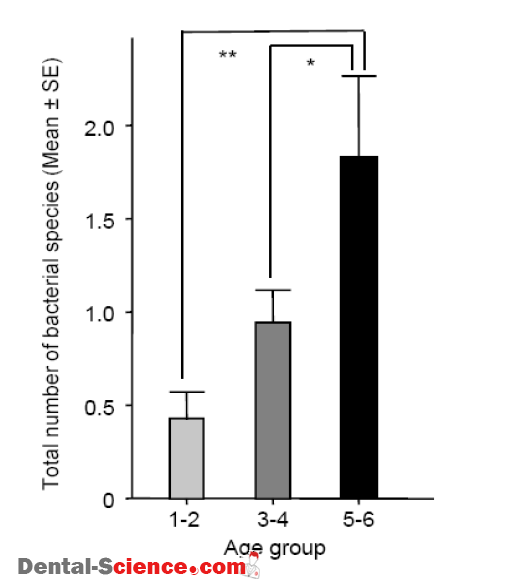 a significantly higher number of total bacterial species than those without these organisms. – The main reason for this result may be because P. nigrescens, C. rectus, and E. corrodens were detected at significantly higher rates in the subjects with RC species. – The detection rate of the RC species in the 2nd collection period specimens were significantly greater in subjects who had 2 or more species detected in specimens taken during the 1st collection compared with the other subjects. 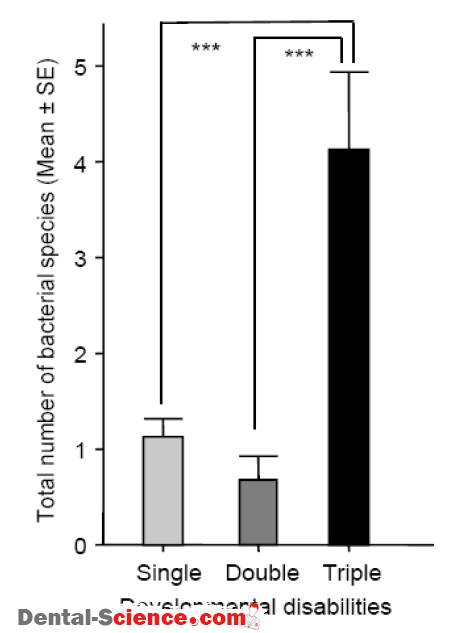 – In addition, the total number of bacterial species in each of the saliva specimens positive for RC species was greater than 4. 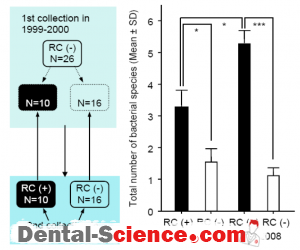 – These results indicate that those subjects who harbor the RC species may be at possible risk for colonization by high levels of periodontal bacterial species during adolescence and early adulthood. – These interspecies interactions are known to play an essential role in balancing competition and coexistence. – Furthermore, synergistic interactions may stimulate the growth or survival of one or more of the residents. analyzed the saliva specimens from 113 children (61 boys and 52 girls) aged 2-12 years old , which revealed 9 combinations of the species simultaneously detected. – It should be noted that C. rectus and E. corrodens tended to be detected simultaneously with the RC species. – Another study analyzing 74 children (39 boys and 35 girls) aged 2-13 years old demonstrated that the presence of C. rectus was correlated with at least one of the RC species (Odds Ratio; 10.4, 95% confidence interval; 1.8-59.6). – The prevalence of T. forsythia and C. rectus in children was low when compared with the other species, while statistical analysis revealed that T. forsythia and C. rectus tended to be detected simultaneously in the children. – It is of interest that the number of detected species in the children with T. forsythia and/or C. rectus was 3.71 ± 1.71, which was significantly higher than that for those without either of those species (1.15 ± 0.92). – The other study analyzing 107 Japanese children aged 8-11 years old and adolescents aged 15 years old showed that P. gingivalis and T. forsythia, as well as T. forsythia and C. rectus were markers for increased risk of developing periodontitis. – It will be of interest to determine whether this hypothesis is applicable to other ethnic groups as well. – Another study analyzing Japanese children aged 0-11 years old showed that the transmission rate was 76.5%. – Thus, S. mutans is frequently transmitted early from mothers to their children, which reflects an environment involving close contact between children with their mothers. various methods, all of which required isolation of each strain. a limited number of studies regarding mother-child transmission of periodontal bacterial species. with a 54 Nakano, At suo Amano and Takashi Ooshima focus on intra familial transmission. – On the other hand, PCR methods using the bacterial DNA extracted from the oral specimens can readily identify organisms in children and their mothers. – Thus, we decided to compare the distribution of oral bacteria in children and their mothers in order to understand which periodontal bacterial species are transmitted from mothers to their children. – Saliva specimens were collected from 113 pairs of children (61 boys and 52 girls) aged 2-12 years and their mothers aged 24-49 years. E. corrodens showed this same tendency. children and their mothers, and the presence of RC bacteria in children was shown to be highly associated with the prevalence in their mothers. – As for the other species, the detection rates for C. sputigena and A. actinomycetemcomitans were relatively high in both mothers and children. – Thus, the presence of these species in the mother-child pairs might have been coincidental and were not statistically analyzed. 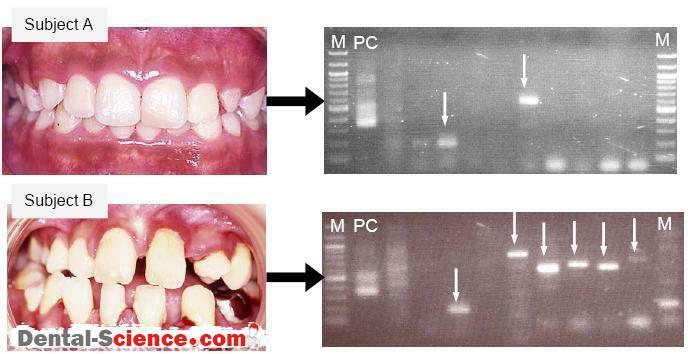 a tendency for detection of P. gingivalis in children whose mothers were also positive for this organism. transmitted from mothers to children. – An additional study analyzing 56 Japanese children and adolescents aged 1-15 years and their parents suggested that P.
– As described above, RC species are reportedly associated with gingival inflammation based on studies of Japanese teenagers. 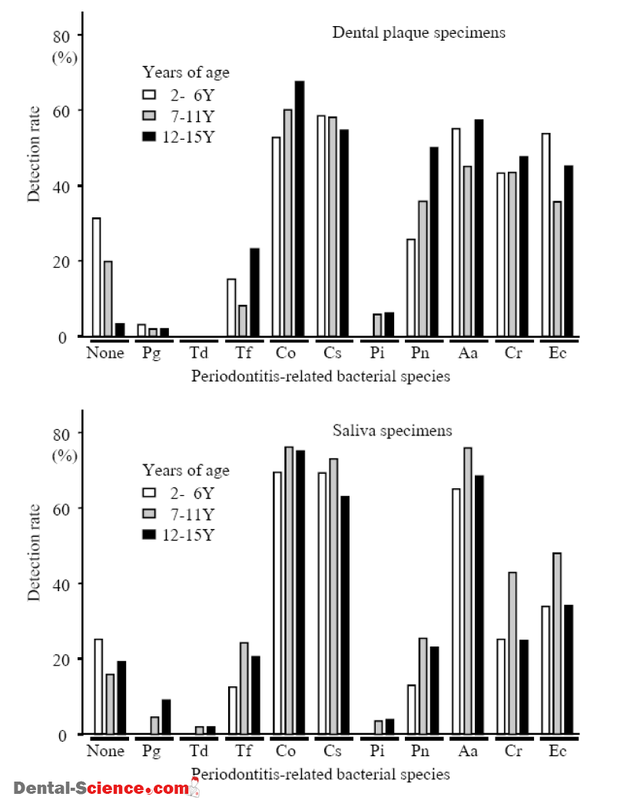 – In our study, approximately 40% of the saliva specimens taken from mothers were shown to possess RC species and their total number of periodontal bacteria was significantly higher than in those without RC species. 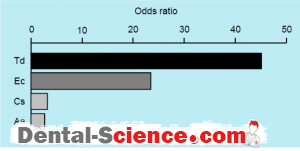 – The detection rate of the RC species in children whose mothers possessed the same species was shown to be significantly higher than in those whose mothers did not (odds ratio 7.4). – In addition, the total number of bacterial species in children whose mothers possessed the RC species was shown to be significantly greater than in those whose mothers did not. regarding the current periodontal condition of their children but also their own periodontal health in order to prevent the early subsequent onset of periodontitis in their children. 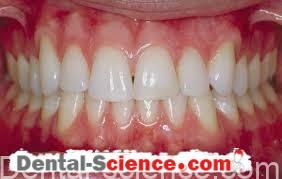 – P. gingivalis is considered to be one of the most important pathogens in periodontal disease. – This pathogen expresses fimbriae, filamentous appendages on the bacterial surface, which are thought to play a significant role in colonization and invasion of periodontal tissues. – FimA, a subunit protein of the major fimbriae, is encoded by the fim A gene which is classified into six variants (types I through V and Ib). – Net table lists the primer sets for identification of fimA genotypes in the clinical specimens. 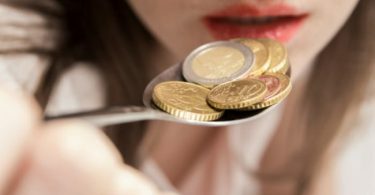 – In fact, several other studies conducted in different countries also support our findings that type II fimA organisms are strongly correlated with the development of periodontitis. – These findings suggest the existence of disease-associated and non-associated P. gingivalis. – Further, 70% of periodontally healthy adults with P. gingivalis were found to carry type I, the remaining carried type V fimbriae and there were a few subjects positive for types II, IV and Ib. 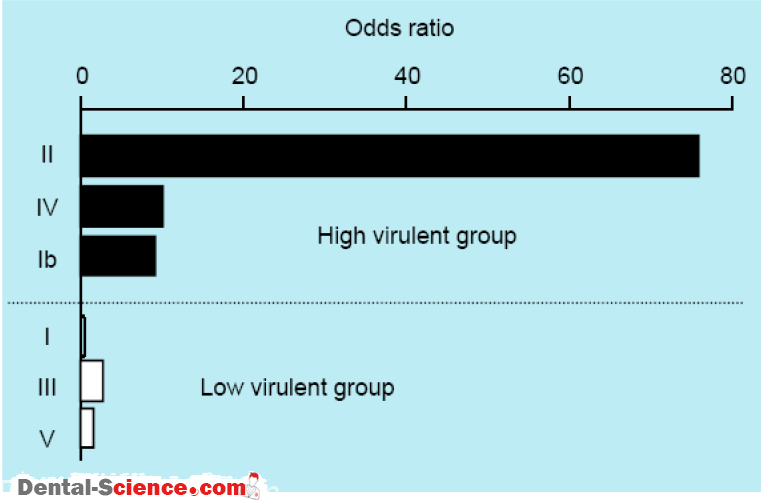 virulent groups, whereas types I, III and V are considered to be low virulence groups. – In addition, the results of in vitro analyses using gingival epithelial cells as well as a mouse model of abscess formation supported this suggestion. 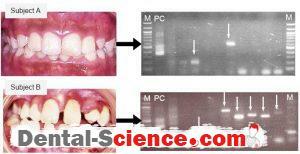 analyzing the types of P. gingivalis fimA genes in oral specimens. frequently detected in older subjects. 25-67% in P. gingivalis-positive subjects. – Therefore, multiple specimens at different times are required to identifyP. 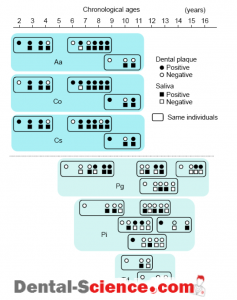 gingivalis-positive subjects. fimA specific primers, while 4, 1, and 2 subjects were shown to be positive for the type I, Ib, and III genotypes, respectively. 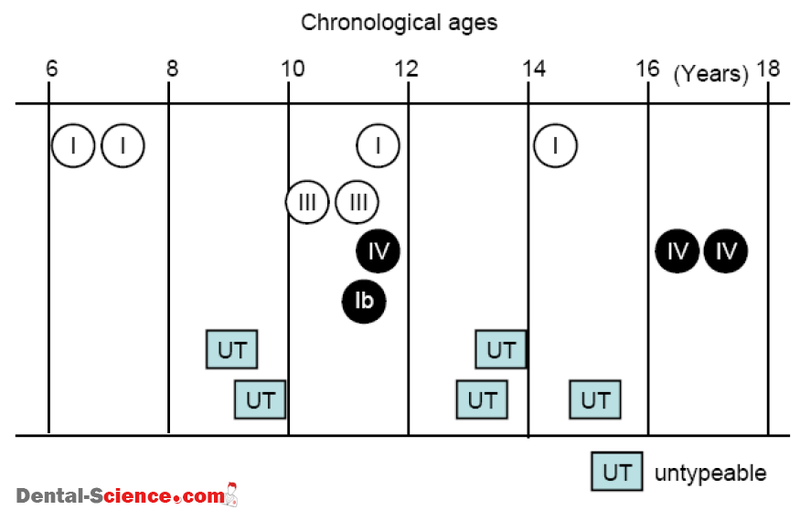 – In addition, the type IV genotype was detected in three subjects in the older age group. – It should be noted that one-third of the fimA genotypes were determined to be un typeable in P. gingivalis-positive subjects. – It remains to be elucidated whether the un typeable specimens contained only a single or multiple unknown fimA genotypes. – However, it is possible that this/these genotypes possibly belong to low virulence groups, such as I, III and V. Taken together, these results suggest that the distribution of type II and IV fimA genotypes is extremely low in children although only a limited number of children do harbor P. gingivalis with low virulence for periodontitis. – Furthermore, some adolescents were found to possess the type IV fimA genotype, which are possibly related to the onset of marginal periodontitis. – un typeable specimens contained only a single or multiple unknown fimA genotypes. – Down ‘s syndrome (DS) is known to be a genetic disease resulting from trisomy of the 21st chromosome, occurring in 1 out of 600-1000 births. – It is widely known that subjects with DS often develop extensive gingivitis at early stages and exhibit extensive rapid and generalized periodontal breakdown in early adulthood, which is estimated to result from impaired immune responses, fragile periodontal tissue and early senescence. – Subjects with DS are commonly encountered in daily dental practice; however, there is little information on periodontal bacterial species using molecular biological techniques in these subjects. – Thus, we decided to analyze the bacterial species in DS subjects. – The distribution of periodontal species in 60 children with Down ‘s syndrome (2 to 13 years old, 5 in each age bracket) was compared with those of 60 age-matched systemically healthy controls. clinical difference from the control group. – PCR detection of the 10 periodontitis-related species in subgingival plaque specimens showed that most of the pathogens were detected with greater frequency in the DS children than in the controls. – T. denticola, T. forsythia, P. nigrescens, and C. rectus were significantly prevalent throughout all age brackets of the DS children. 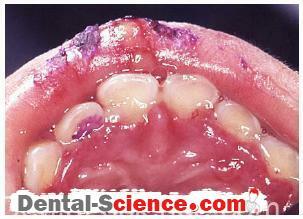 – The occurrence of P. gingivalis was also significant in the DS subjects over 5 years old. – These results demonstrated that important pathogens for several types of adult periodontitis, such as P. gingivalis, T. forsythia and T. denticola, are frequently found in DS groups. – Although these species are considered to be transient in systemically healthy children, early colonization could occur in the DS group. – In addition, the severity of gingivitis was associated with increased varieties of the resident pathogens as well as the distribution of P. gingivalis. P. gingivalis with type II fim Agenes. impaired significantly by P. gingivalis type II FimA as compared to those from systemically healthy subjects. – This impairment is likely due to invasion of P. gingivalis readily leading to impaired cellular motility, which is estimated to prevent wound healing and the regeneration of periodontal tissues. subjects as compared to systemically healthy individuals. attending daycare centers due to the developmental disabilities. or pervasive developmental disorders. Dental plaque specimens were collected from the buccal side of the maxillary left second primary molar. 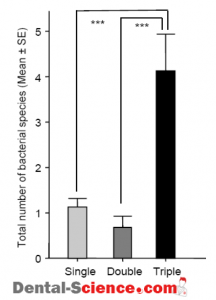 – PCR analyses demonstrated that C. sputigena was the most frequently detected species (28.3%), followed by A. actinomycetemcomitans (20.9%) and C. rectus (18.2%). E. corrodens, C. ochracea, and P. nigrescens were detected in approximately 10% of the specimens, whereas T. denticola, T. forsythia, and P. intermedia were rarely found, and P. gingivalis was not detected in any of the subjects. 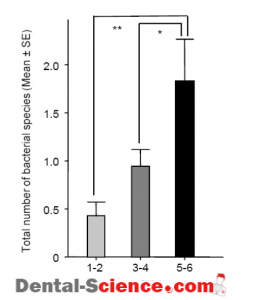 – The mean value for the total number of the 10 tested bacterial species in all subjects was 1.16 species, which was positively correlated with age. – In addition, the total numbers of detected species were positively correlated with the age of the subjects, with a maximum of 8 species identified in one subject. 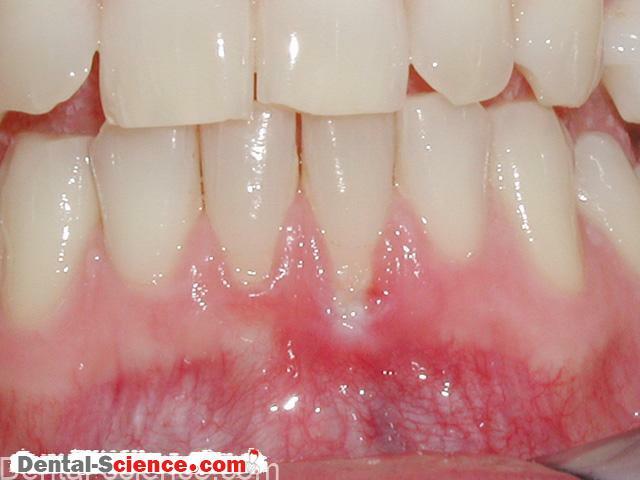 C. rectus is one of the possible indicators for risk of periodontitis. – On the other hand, the clinical parameters evaluating periodontitis were shown to be worse in the group of subjects complicated with concomitant MR, CP, and AU. – The total number of the species detected in this group of subjects was significantly higher than those of the other groups complicated with a single or two concomitant diseases of MR, CP, and AU. as compared to subjects with a single disability. T. forsythia, and C. rectus) and should also be regarded as possible subjects at risk for the onset of periodontitis. – These subjects are currently receiving special periodical professional oral health care. – Periodical PCR detection of the species could be beneficial for evaluating their current oral status and to estimate their future risk for the onset of periodontitis.